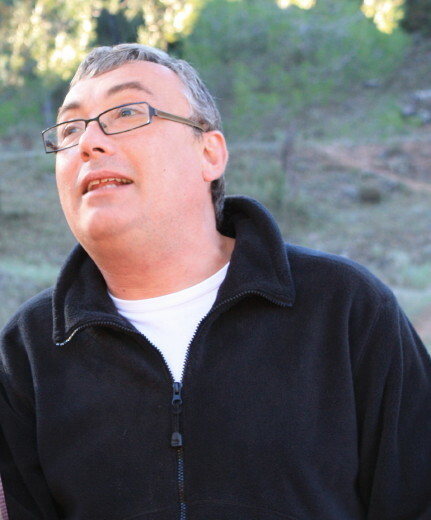 We continue with our Talking with Spain series which focuses on personalities from all walks of life in Spain. 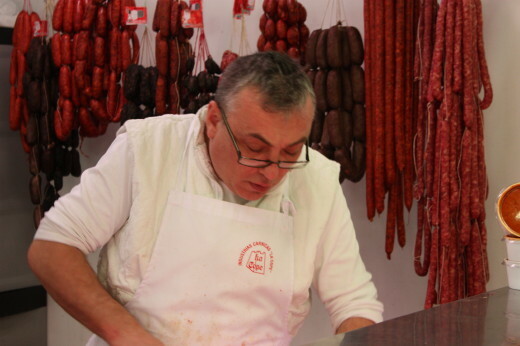 This week we talked to Leandro who is a butcher. He also happens to be my cuñado(brother-in-law). 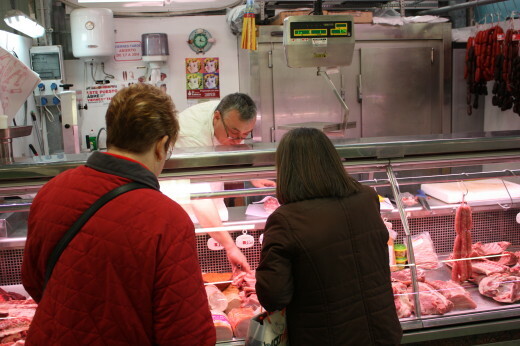 He owns a market butchery stall in the local covered market of the Valencian town of Burjassot.The market is not a gourmet one but a typical Spanish market which provides excellent quality fresh produce to the locals. I often hear people say that Spain is a difficlut place for a vegetarian to live. While this in some respects is true in that Spanish food culture enthusiastically embraces all types of meat from wild boar to beef through to horse,it is also true that Spanish cuisine is full of fantastic vegetables and vegetable dishes. So vegetarians have a great selection of products.However, this article might be offensive to some so apologies beforehand but this is just a reflection of what’s out there. Some of he stranger cuts..pigs trotters,lambs feet and others. 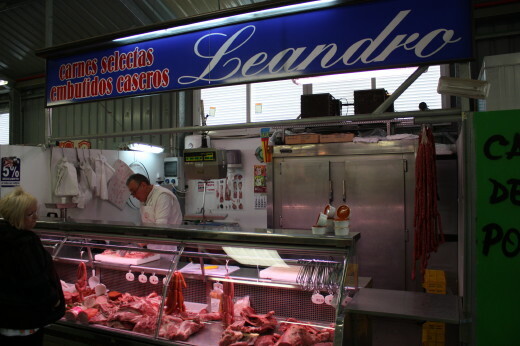 Leandro does not sell horse or wild boar but it is surprising how much he sells of the stranger parts of the animals. Or at least the stranger parts for an Anglo Saxon supermarket shopper! I have left out the “stranger” photos but sheep’s head,livers,cow’s and pig’s faces and trotters are commonly bought to make a selection of stews,soups and dishes.Historically very little went to waste from any animal in Spain.This, of course, is changing as the younger generations lose these customs. Part of the sales relationship with his customers means making them feel relaxed and in familiar surroundings and if you watch Leandro in action he has a great patter going with all the customers. His mix of cheeky,ironic and outright funny humour is so popular you can see the customers listening and waiting to laugh. He is almost like a stand-up comedian. So when did you start working in the meat business? Well I started out when I was eighteen years old driving a meat delivery van. When did you become a butcher? Not long after and then a couple of years later in 1990 I set up my own business. Which of your products sells best? Pork is what sells most…all cuts and pieces! How many hour do you work a week? Has the economic crisis affected your business? Definitely, I used to have an employee previously but now I only sell enough to cover one salary. Also the town hall moved the market from its original place in the centre of town temporarily to do rennovation work on the market building and we have never moved back from this less central location. How much holiday do you take every year? Four weeks and always in August. Market life is not easy and Leandro like everyone in the market has to get up very early every day. He works for himself,by himself; long hours and on his feet all the time. The day to day economic problems are directly visible in what the customers purchase.Leandro says people buy cheaper cuts,bones etc to make soups,stews rather than lamb chops or fillet steak. Like in so many sectors of the economy hard times are visible in the market but the jesting,joking and good humour that everyone in the place injects into their daily lives is to say the least impressive. A lesson for all of us. The Spanish Thyme Traveller sells classy Spanish food and drink brands round the world. Email me for further info: pwaller@thespanishthymetraveller.com. 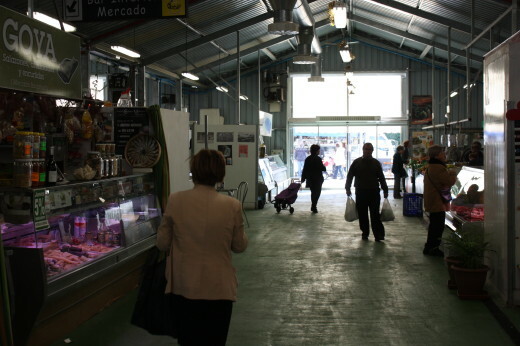 This entry was posted in spanish culture, spanish food and tagged butchery, chorizo, Customs, Food, Food and wine tours Spain, food experience, fresh food markets, gastronomy, meat, morcilla, Spain for foodies, Spain tours, spanish culture, spanish food, Traditions by Paddy Waller. Bookmark the permalink. We have a regular fishmonger and a great alimentacion but we haven’t formed a relationship with a butcher yet – your interview makes me want to. Thanks Robin….if you find one like my Cuñado then you can have a laugh as you do your shopping! 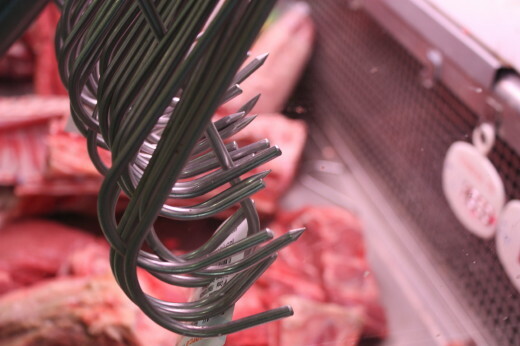 Good article – very similar to my local butcher. I really enjoy having the choice of what meat I buy and how it is prepared by a butcher, rather than buy pre-packaged from a supermarket. Thanks Sue ..totally agee much nices to choose your own meat! Fabulous insight to Real Daily Life in Spain. In Barcelona I would go to a butcher stalls in the local market (I knew them) and ask for a good steak to be made into a burger with chopped onion added in. A great way to know exactly what was in the meat. They would complain about it being a waste of steak but they were amazing burgers. Not possible at the supermarket. Thanks for your comments Molly..agree….it is much better to see what goes into your purchase. Not only the local butchers but also the bakers and fishmongers are an enrichment to living in Spain and feeling like a local in no time at all. Speaking the language does help though. Inka Thank you for commenting. It is definitely a great way to shop even if you dont speak much…It is a good way to learn. Four weeks holiday every August ? The people in Burjassot must either turn Veggie every summer, or have big freezers. Haha..This is Spain! Everything closes in Aug. It is a national pastime(less so nowadays than before) for everyone to go on holiday a the same time.Never seent the queues of traffic on the Madrid- Valencia or Madrid-Alicante roads on 31 July or 31 August? 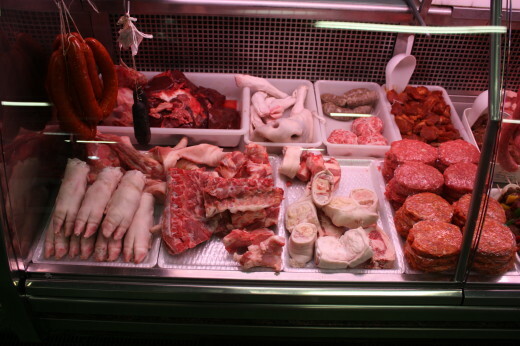 I’m living in Spain currently and I’ve found wonderful butchershops all over, and I love it! However, I’ve got a question no one’s really been able to answer for me due to my very limited amount of Spanish. In butchershops, you see containers/tubs of what looks like fatty bacon/lard, something of white salty appearing bones, and thin sheets of dried fat. That’s the easiest way for me to describe it. What are they and how are they to be stored? A friend of mine once mentioned that they’re for soups, but beyond that, didn’t really add more to it. I’d really like to know what to do with those things, they seem interesting! This is exactly the question I have too. I am looking for the names of each item and a recipe to use it all in. Thank you.